Hello again! This is Jacquelene Hollier Jackson again with another great how-to blog for my community! 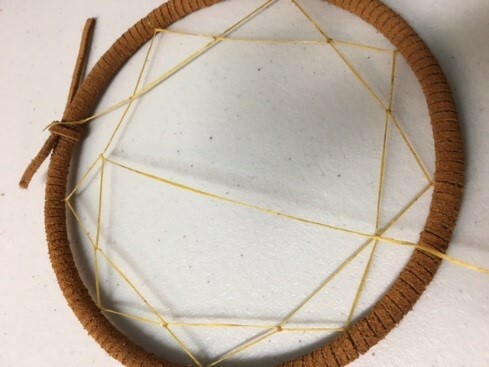 As a young Muscogee Creek learning about my Native American Heritage in Detroit, I learned how to make dream catchers and I learned teachings around them. 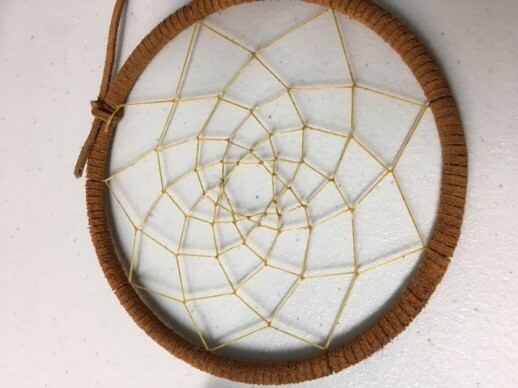 Some teachings say that the reason you have good dreams under a dream catcher is that the bad dreams get caught in the web part, others say that each knot tied is a grandmother or grandfather spirit protecting you from bad dreams in the spirit realm. At first I didn’t know which I believed more but as I made more and more dream catchers I found that I did not have to know the answer now. And I’m not sure if I do, but I do believe somewhere something/someone is helping me to have good dreams. That is the secret of faith, you trust even without knowing all of the information or having all of your questions answered. And that is how dream catchers and the knowledge of ancestors has helped me to open a door into my spirituality. 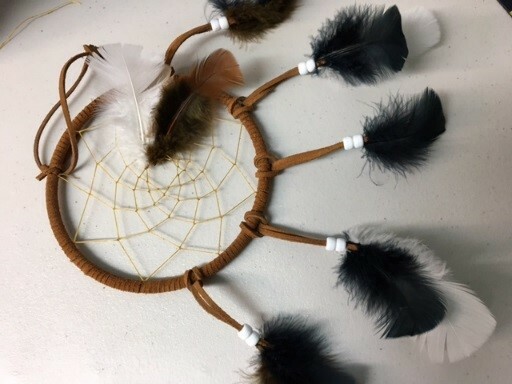 I hope this tutorial on Dream Catchers can help you in similar ways. Step One: Get your supplies together. 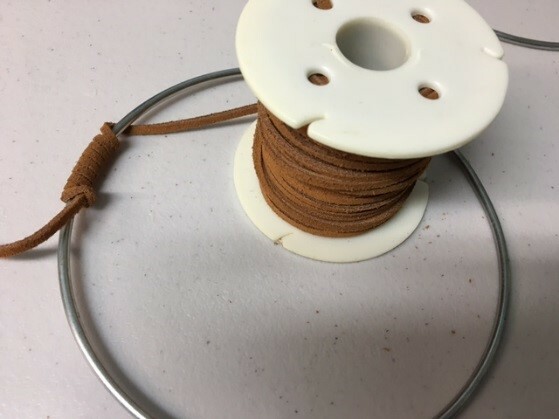 You need a hoop, sinew or string and something to wrap the hoop. 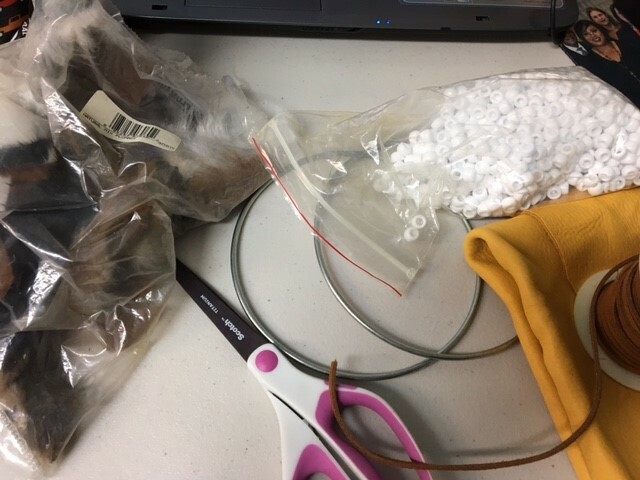 I will be using leather, scissors, glue, and things to decorate with like feathers or beads. Step Two: set aside everything except for your hoop and the material you choose to wrap it with. 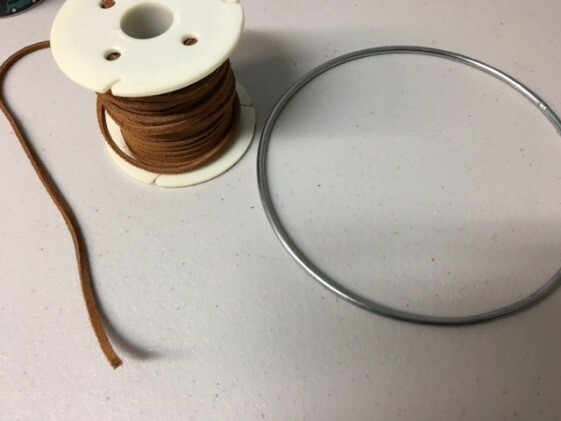 Step Three: With your material wrap the hoop completely so none of the metal is showing. 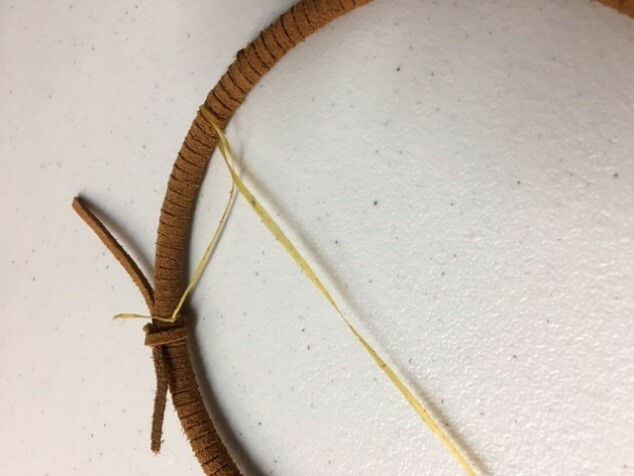 (I use glue sometimes to hold it together in the beginning, but you don’t have to a simple knot will suffice. 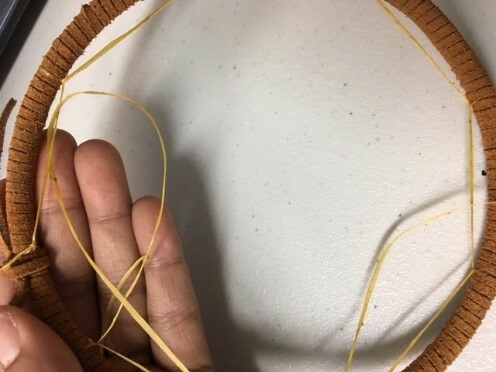 Step Four: Next we will begin the inside part of the dream catcher. This part gets a little confusing. You will tie a knot in your sinew first with one end very short. 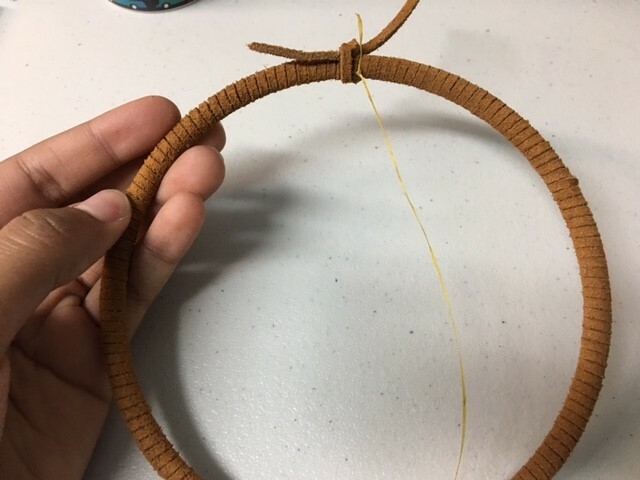 Step Five: Take the long piece and go over the hoop. 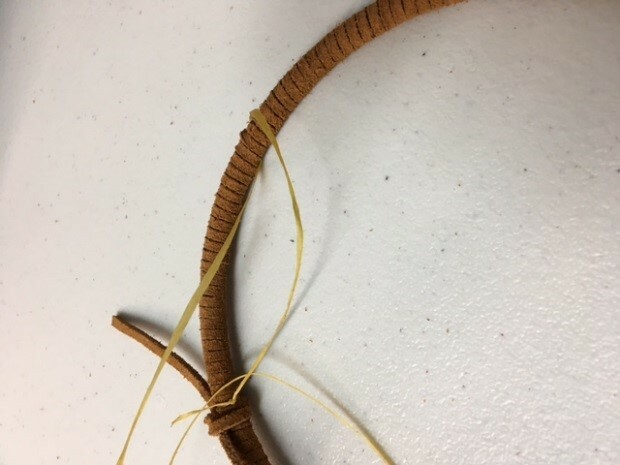 ** Important traditionally there were knots on the hoop for the 13 phases of the moon but you can do however many you would like. 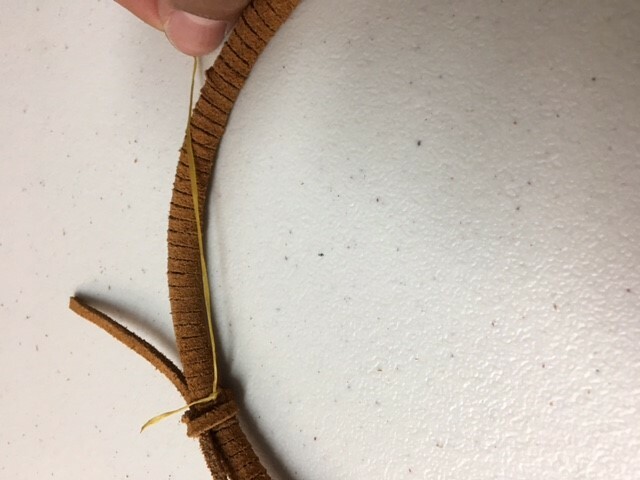 Sometimes I will do smaller sections and pull tight on the sinew because I like how it looks so however you do it is up to you. 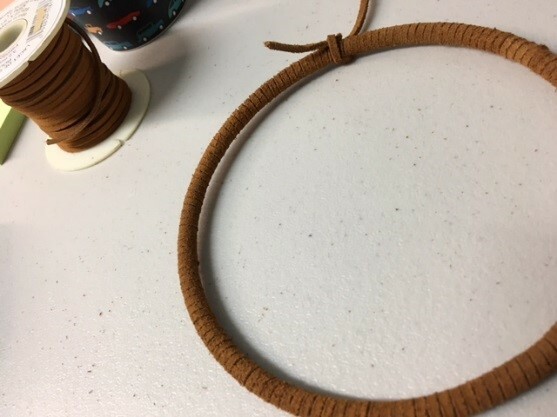 Step 8: To finish, tie a knot in the center and carefully cut the extra. 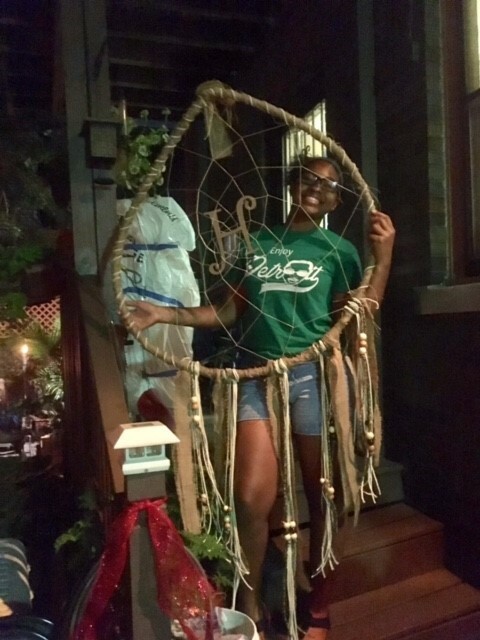 Add any decorations you want and VOILA you have made your very own dream catcher! I hope your learning continues and your crafting helps with your personal wellness journey.